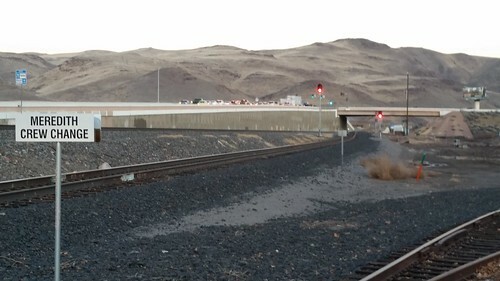 While making the rounds and driving along I-80, we spotted something along the railroad that is both ordinary but also out of place, and at Lisa's suggestion, I got off the freeway and managed to find a place where we could access the tracks. Amtrak locomotive 193 is in this shot backing out of the siding in which it was parked. A few minutes later, we saw it heading back down the main line into the main Sparks Yard. 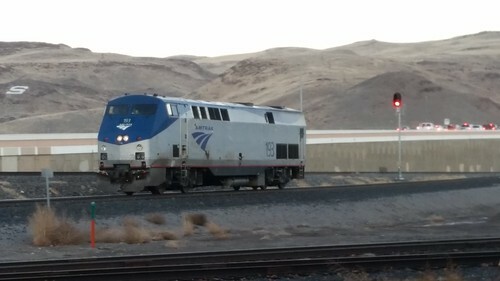 This would be the unit that was on an eastbound California Zephyr a few days ago and failed. Amtrak dumped the unit here at Sparks and borrowed a Union Pacific locomotive. I saw that train heading through Fernley that day. Fortunately the CZ has two passenger locomotives; the trailing unit could still provide "head end power" to the train's hotel functions. Presumably whatever was ailing this unit had been repaired and it could move on its own power again. We speculate that it will be added to the next Amtrak train coming through (tomorrow's westbound CZ) and sent on its way home. This was the spot we found. (I've geotagged the photos with the approximate location.) We had never been here before, but from the tire tracks and because of this sign, we assume this is a location where train crews of eastbound trains swap out and from here are driven to the yard office rather than having to trudge the length of Sparks Yard. After our various shopping trips and impromptu railfan side trip, we went to dinner at the Nugget Oyster Bar, as trying to fight our way across town to the Peppermill at the peak of rush hour seemed like a bad idea. Lisa drove us home after dinner and put the battery back into the UPS, then vacuumed under the desk while things were handily out of the way. Everything came back to life correctly, and we should be good to go for a couple more years of battery life.